It is most beneficial for you and your cat if you accept the fact that cats are animals, not "furry kids." Cats are excellent animal companions. They are intelligent, beautiful, and loveable creatures. Even though, people take care of cats for centuries, they still have their instincts. Good communication helps to discipline your cat. A disapproving tone and gentle tap on the cats nose all that are needed in most cases. The most important is to make the rules of the house from the very beginning and stick to them. Cats are night animals. They are more active in the early mornings and late evenings, which is the best times for cats to hunt. They rest and sleep the rest of the time. Cats cannot possibly understand why they have to be quiet at night, best time for playing and eating. Your cats could adjust to eat in the evenings and late mornings, if you do not get off your bed at 4-5 a.m. and feed them at night. If a cat get a response from his human when he plays at night, the human become a squeaky toy for a cat. Do not encourage your cats to be active at night time, and they will get used to your schedule. Feeding dry food in the mornings and wet foot and other delicious food in the evenings or afternoons might help - your cat will not become excited about his morning meal and sleeps more. If your cat urinates out of his litter box, he might have urinary tract problems. You have to check his health as soon as possible. Some cats just have "bad manners." All you could do is to make your cat's litter box more attractive. Put it in a place where your cat can have some privacy. Buy a few litter boxes in different shape. Try to offer your cat different litters. It is possible he doesn't like the sent of the litter you are using for his litter box. For cats that dig too hard and make a mess around their litter box, try to use a litter box with an entrance from the top of litter box. Scratching is cat's natural behavior. Introduce the scratching post to your cat on the very first day. Encourage your cat to use scratching post. Let your cat know you disapprove his using your furniture for scratching and you like when he use a scratching post. You could spray it with cat nip or attach some of cat's favorite toys to it. Trim your cat's nails tips. When you choose furniture for your home, keep you cats scratching behavior in mind. * There are too many unwanted cats and kittens in the world. 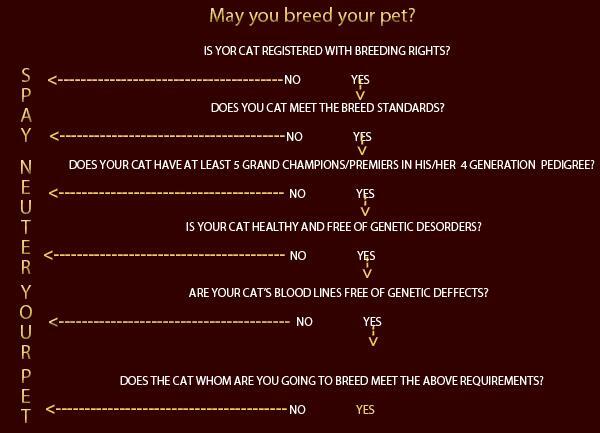 Please do not breed cats which were not chosen for breeding by the breeder you purchase your cat from. Please do not breed your cat because your friends or family want kittens from you cat. * De-sexed cats live 1.5 longer than entire cats, because they are healthier. De-sexing decreases the risk of getting urinary tract problems by 20-30 %. De-sexed cats don't have hormonal ups and downs. They definitely have less stress from abstinence. Entire females might go in heat every 2 weeks for 7 days. Their bodies can stay in estrus until they mate. If a female cat goes in heat many times without mating, she might get endometritis, pyometra, or other reproductive system problems. * De-sexed cats are safer. Not only do entire males mark, but they meow very loudly to attract neighborhood females. Burmese cats are indoor only cats. They have been pampered for centuries, so they do not protect themselves when they go outside. They don't even know that they have to run away from the car. Most entire males have an urge to go outside and look for available females and mark the territory they live on. * Living with an entire cat is very uncomfortable. Entire cats spray. There is a big chance that an entire male cat will mark all over the place: your doors, furniture, walls, and even clothes and shoes. Some male cats start spraying at the age of 7 month. Male cat might start marking later, when he is 2 years old. De-sexed cats do not spray. More over, de-sexed cats' urine doesn't smell as bad as the entire cat'. Most female cats become very laud when in heat. Male cats could meow constantly to attract a potential mate. * De-sexed cats have more pleasant personalities. Without sexual and hormonal "problems" cats enjoy their life more. Cats do not understand physical punishment - it's just does not work for cats. Lean how to punish your cat in a cat's way. Hissing might be very effective. Cats understand light tapping on nose and cheeks. You can hold your cat by grabbing his skin between his shoulders, where mother cat grabs her kitten to carry them, lift cat's upper body and hiss at him looking into his eyes. This technique works very well on male cats. Cats don't get mad at his human and they don't think they were treated badly when punished this way. Cats should know their place in a family hierarchy, as they do in nature. It is not comfortable living with a cat who thinks he is a boss of the household and he can do whatever he wants to. I believe that cats have a power to communicate without using their voice, on a spiritual level. Somehow I know what my cat is trying to tell me. It’s an amazing feeling. Burmese cats are talkative cats. Every cat has his own voice and vocabulary. When you come home they tell you what happened while you were not here. They greet you when you approach to them. If they need something, they are not shy to ask. It’s easier to understand your own cat, if you pay attention, spend time with him and talk to him. If you love your cat, your ear become tuned to the nuances of your cat’s own voice. Cats are smart. They do not need attending communication classes to learn that language is only a bunch of symbols and everybody applies their own meaning to each symbol. Cats do not listen to the words; they listen to the meaning of them, to intonation of your voice. If they like what you say to them, they replay to you and purr. Most people think that purr is a sign of pleasure. In fact, cats purr not only when they experiencing pleasure. Cats could purr when they are in a great pain, or overexcited, or scared. Purring, very attractive and heartwarming sound, is one of the reasons to love cats. Cats vocalize to each other only in a crisis situation. Their normal communication is a body language. Cats have a sophisticated range of messages, which they transmit using their ears, tail and whole body. People could easily recognize some of cats' emotional expressions. Licking and light biting means a great compliment - your cat is showing affection. Horizontal lashing of the tail - your cat is irritated. Fluffing up of the tail and coat - your cat wants to appear larger in size and scare someone. Tail and ears are up - your cat is happily exited. Ears flattened sideways - your cat is uncertain or suspicious about something. Squinted or slowly closed and opened eyes - your cat is emphasizing his love and trust. Head is down, back legs are tapping - the cat is ready to attack. Head is down sideway - the cat gives up a fight. Communicating with your cat is very rewarding. It makes your companionship with your cat more pleasurable and satisfying.